I’m always looking for new ideas for easy, healthy snacks for my daughter. She’s not yet 2 years old, and would prefer that what I give her be “fun” to eat. Jello fits the bill perfectly. It comes in red, green, yellow, purple and even blue. I’m all for eating the rainbow (when it comes to vegetables), but when it comes to desserts, I’m a little leery. Those colorful gems are loaded with food dyes and artificial flavors, not to mention a ton of sugar. That’s why I’m psyched about these new homemade jello recipes just out in the new issue of EatingWell Magazine. Yes, you can make jello without the box, and it can be a colorful, delectable experience, without the use of food dye, fake flavors or tons of sugar. Here are the keys to making healthier, better jello. 1. Start with this one essential ingredient. You can’t make jello without gelatin. In the boxed version, it comes mixed up with the sugar, color and flavorings, but you can buy gelatin, an odorless, tasteless animal protein, in powder form, in packets on its own. It needs to “bloom” in water, then needs to be “melted” by hot liquid before its thickening action takes place in the fridge. The more gelatin you add, the thicker your jello will end up. Adding just an additional envelope of gelatin to your mix can give you jigglers, a hand-held version of jello that’s stiff enough to eat with your fingers or pack into a lunch. 2. Use fruit juice in place of some sugar. Jello should be sweet, but it doesn’t have to be cloying. So in our recipes we use minimal sugar blended with fruit juices. Other advantages of using juice: it adds flavor and color. 3. Fill it with fruit. Another way to flavor your jello is by adding fruit. Fruit adds fiber and other nutrients and also makes it beautiful. 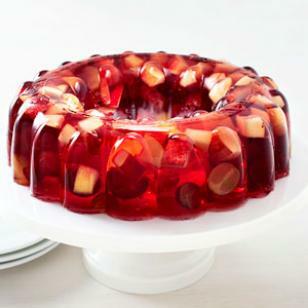 If you are using a jello mold and want to make it look impressive, try adding the fruit when the jello is a little fluid (not completely set) so the fruit is suspended evenly in the mixture and doesn’t sink to the bottom or rise to the top of the mold. 5. Make it for adults too. Who knew that the jello shots I made in college would take on a new life in my thirties? If you want to make jello as a dessert for just adults, try adding booze to the mix (just not as much as you might have added in your younger years). Sweet red wine mixed with grapes makes a beautiful sangria-inspired jello, while adding Champagne to cran-raspberry juice gives it a lovely bubbly look.